I would keep this for myself, but I would love to give one to my daughter as well. I would keep this for myself, and like the ability on the website to create your own workout video from 70 video clips! I would give this to my grandaughter. 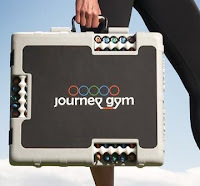 I would keep the journey gym for myself. i like how you can work all muscle groups with it. I like that It’s lightweight, compact and portable design allows people to workout whenever and wherever. I'd love it for myself and my husband. I would definitely keep this for myself. It would help out so much with workouts! I like that it is so compact and you can take it anywhere ! I would keep it for myself for a gift! I would keep it because I really need it, I like that it's portable & can take it with me. I'd keep it for myself. My favorite item is the journey gym but I also like the nutrition bar.